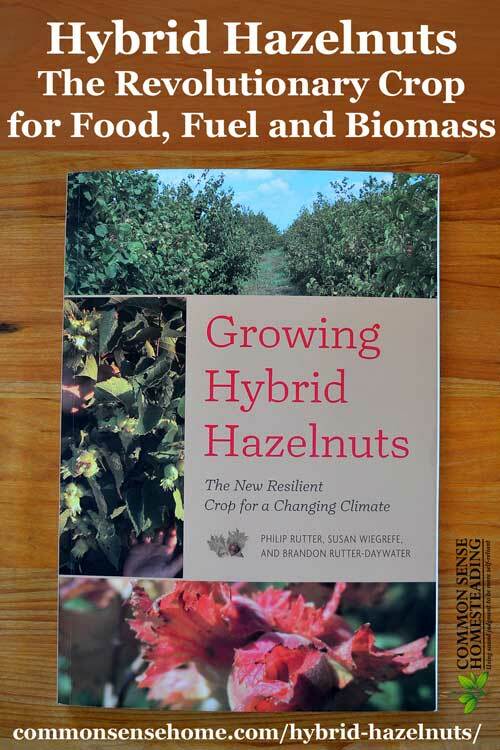 Growing Hybrid Hazelnuts: A New Crop for a Changing Planet challenges the reader to imagine a future where vast hazelnut groves provide food, fuel and biomass while restoring soil and creating vibrant ecosystems. The authors have seen the potential of a plant industry still in its infancy, and firmly believe that hazels may be a world changing crop. Will their vision become a reality? It's hard to tell, but they're sure giving it everything that have to give. 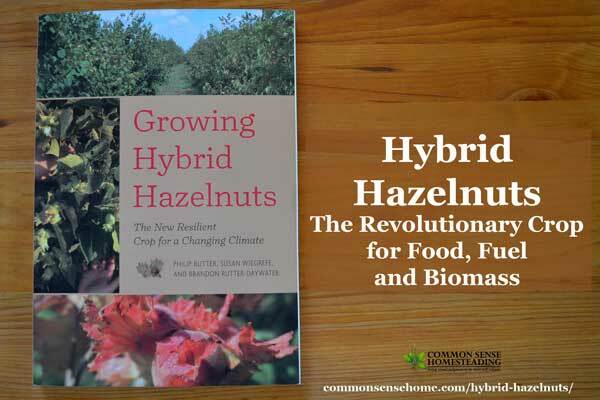 If you're ready to help build a perennial based food system, then “neohybrid hazel” should become a part of your vocabulary. What is a “Neohybrid Hazel”? They use hybrid storms – stable populations of hybrids that have survived beyond the initial hybrid generation. These hybrids are crossed and recrossed over generations to produce the most desirable traits. The three species they started with as parent plant were the American hazel (Corylus americana), the Beaked Hazel (Corylus cornuta) and the European Hazelnut (Corylus avellana). The European hazelnut is currently the basis of the world hazelnut industry. The goals of the breeding program include, but are not limited to: improved cold heartiness, resistance to Eastern Filbert Blight (EFB, which currently wipes out European hazels), larger harvests and the capacity for machine harvesting and processing. They are making progress. Their nut bushes are largely unaffected by EFB and other diseases. Since their primary breeding area is in Minnesota, you know the survivors are cold hearty. Some neohybrid hazel bushes bear nuts in clusters of over 20, instead of 5 or 6 like standard hazels. Mechanized harvesting is still an issue, as the gene pool hasn't yet stabilized to a uniform height. Neo-hybrid Hazelnut plants are resilient. Once resistance to EFB is established, these bushes are survivors. With roots stretching halfway to China (about 11 feet deep), the neohybrid hazels can recover from floods, droughts, fire, winds – you name it. Any one of these threats would destroy most standard crops and orchards. The neohybrid hazels may be slowed in growth or knocked back for a season, but they rebound amazingly well. Hazelnut bushes produce a wide variety of products. It's not just about nuts for eating – although nuts and nut flours are increasingly popular. Initial studies of hybrid hazel oils indicate that they are superior to soybean oils for biodiesel production, with a higher oxidative onset temperature and lower cloudpoint. They also produce roughly double the amount of oil per acre, compared to soybeans. Full color photos throughout the book help clarify key points of the text. The gene pool still isn't stable. This crop is still very much in the development stages. There's no guarantee of what size a shrub will stabilize at after coppicing. Production volume and nut quality is still also highly variable. The authors compare their work to the development of corn from teosinte, or the transformation of commercially produced soybeans. Lots of promise, lots of work still to be done. Wildlife – While crops may initially escape notice of the local wildlife, the honeymoon doesn't last forever. It's like the movie “Field of Dreams” – if you build it, they will come. Depending on your area, wildlife pressure may be low or high, but must be taken into account. 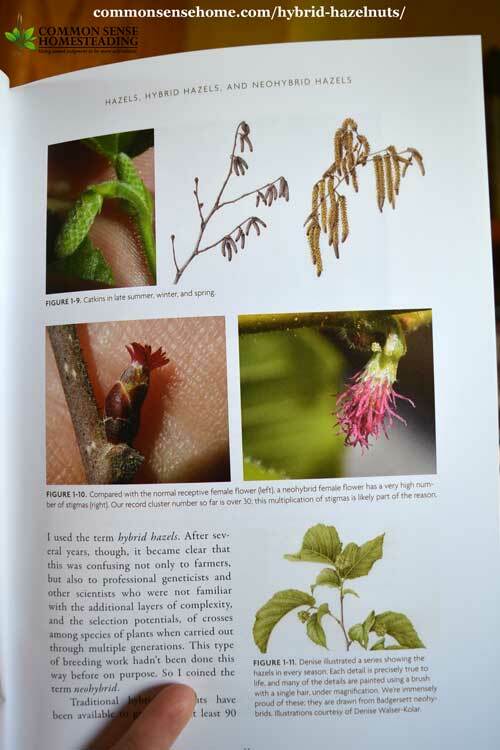 The book shares a variety of tactics for protecting your crop. Creating a market – The flavor of neohybrid hazels isn't the same as European hazels, which are the industry standard. In a marketplace that's all about uniformity, it can be tough to get market share for a new product. Still, with the growth of the local food movement, microbreweries, fermentation and other “foodie” trends, the timing couldn't be much better for a unique, homegrown flavor. The variety of income streams from a single crop is also promising. Years to harvest – This is probably the single biggest hurdle for the potential hazelnut grower. It's likely to be 7 to 10 years for a sizable crop, and longer than that to produce a profit. Interim income streams are needed. We're using hazel strips as part of our permaculture plantings, with chicken tractors rotated through the nut orchard area for extra fertility and an interim crop. Are Hybrid Hazelnuts Right for You? If you're east of the Rocky Mountains, own land and are willing to invest in long term production, neohybrid hazels are worth considering. If you don't have property and want quick returns, another crop is probably a better choice. We need visionaries like the team working on the development of these nuts to create a more productive, less destructive food system – but the transition is going to take some work. It's all a piece of the puzzle. The authors understand the difficulty level involved here. They break things down so you know what you're getting into. One of my favorite blunt statements in the book is, “So let's look at some numbers and discuss strategies for not going broke during the establishment phase of a hazel planting.” I sincerely appreciate the lack of “sugar coating”. They're believers, not fanatics, and are hoping to inspire the reader to tackle this undertaking with them. Can you purchase these yet? If so, where? I have to say I hate hazelnuts and wish my neighbors would never have planted them. Although they are pretty to look at I hate that the squirrels gather the nuts and bury them everywhere. Sometimes they forget where they buried them and then a bush/tree springs up in the most inconvenient place! I also hate that I have to pick up all the nuts before I can mow my lawn because the nuts aren’t good for the mower blade. I guess, just know they are messy but a beautiful tree and they do produce well once established. Yeah, I don’t think they’re a good fit for an area with mowed lawns nearby. City folk just don’t get it!! LOL! I would like yo buy the book. Where can I find it? You can find the book at Chelsea Green or on Amazon at http://amzn.to/2iMsNJG.